Enormous congratulations to everyone involved in our crowdfunding campaign and a warm welcome to all our new members! Colossal gratitude to all who pledged, spoke about our campaign with their neighbours or who shared it on social media. We smashed our target with 2k over funding and 76 brand new members! This is a huge shared achievement and simply would not have been possible without the dedication of our active members and supporters. All contributions, no matter their size helped us to reach our goal. It is important to recognise those people who went the extra mile. So special thanks to Sim Takhar – The Old Bank Vault, Qusai Jafferji – Newmans Stationery, Rosie Wolfenden – Tatty Devine, Sarah Marks – Button Bags, Ella Doran – Ella Doran, Len Maloney – JC Motors, Juliette Tuke – Milagros, Paul Gardner – Gardners Bags, Han Ates – Blackhorse Lane Ateliers and everyone who appeared in our crowdfunding film. Huge appreciation also goes out to our existing members who pledged support on top of their membership fees. 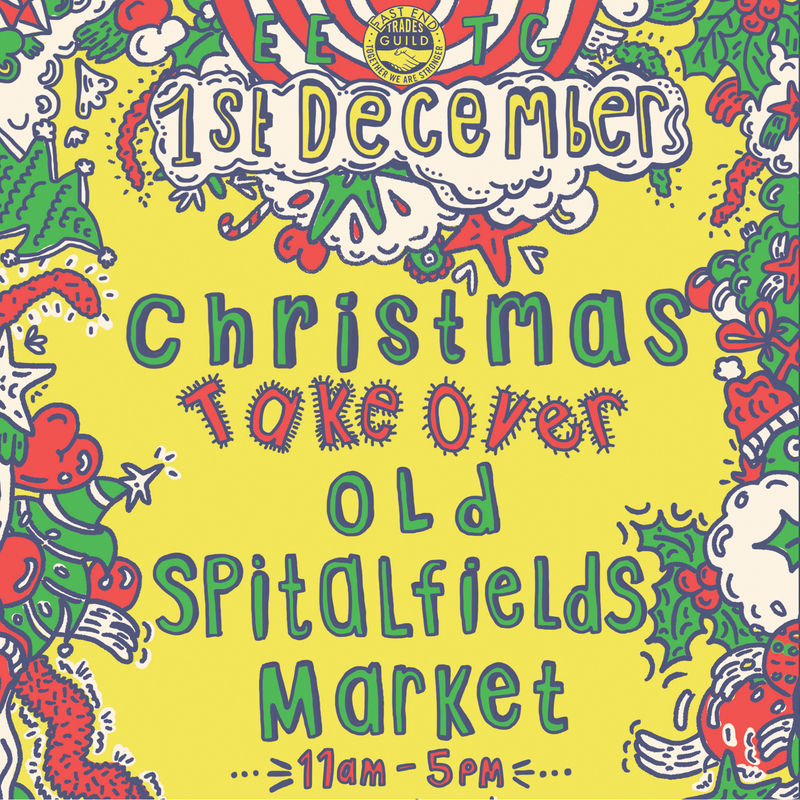 These members are Baddeley Brothers, the Brick Lane Beigel Bake, E5 Bakehouse, Ince Umbrella’s, Marybow Property, Pages of Hackney, Quaker Street Cafe, Local Buyers Club, Laxeiro, GH Cityprint, the Live Art Development Agency, Rochelle Canteen, Upstarter, Johnston Architecture, The Kenton Pub, Showhow, Tatty Devine, Lady Dinah’s Cat Emporium and Crescent Trading. Last but by no means least, thank you to THE GENTLE AUTHOR and Herb Lester for the kind donation of books which are on their way to the first ten businesses to have pledged their membership. 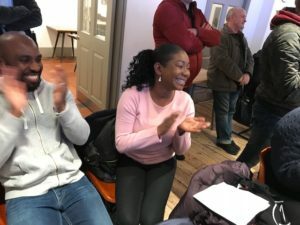 ELECTION VICTORY FOR GUILD REP TAYO ABIMBOLA FROM FRANCESCA FABRICS! 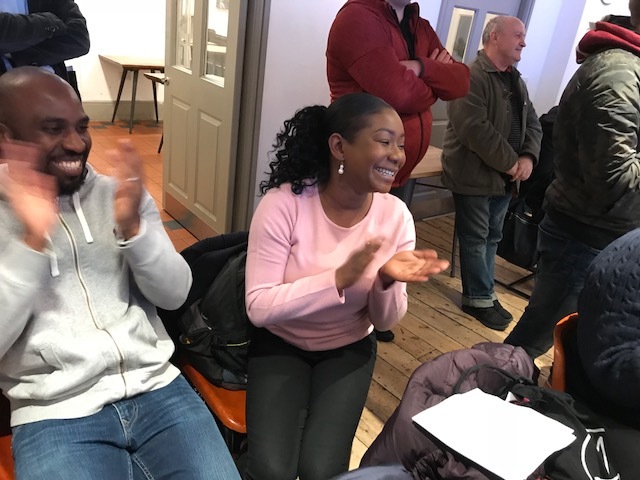 Congratulations are also in order for Tayo Abimbola who was elected to represent small businesses on the committee of the Spitalfields Neighbourhood Planning Forum on Tuesday 30th October. The forum is involved in setting planning policies in Spitalfields that will impact upon small businesses in the area. 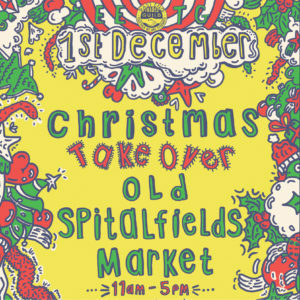 EETG CHRISTMAS TAKE OVER AT OLD SPITALFIELDS MARKET – 1st DECEMBER, 11 TO 5. 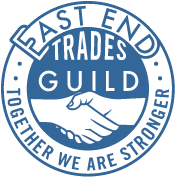 Join members of the East End Trades Guild at Old Spitalfields Market on 1 December. Pick up your free East End Independents Map- hot off the press! With a special performance from the Wing-It Singers at 1.30 pm. Shop Independent this Christmas! Distinctive, fun and quality Christmas gifts from Tatty Devine, the Duke of Uke, Artisans & Adventurers, the London Bike Kitchen, Outdoor People and more will be waiting for you. Make sure you spend your money where it counts this Small Business Saturday. MEMBERS BREAKFAST & FELLOWSHIP AT QUAKER STREET CAFE WITH 20% OFF ALL FOOD AND DRINK! See yourself through to the weekend, come and grab some delicious fresh coffee and pastries from EETG members Quaker Street Cafe and enjoy a 20% discount on all items! As well as the tasty food and drink on offer, you will be warmly welcomed by your local Spitalfields Guild members, who can fill you in on all the latest neighbourhood news. Who knows what could be around the corner for you and your small business? Join us to connect with your neighbours for collaboration, peer support and trading opportunities! The space is cozy so book here soon to avoid disappointment! accredited Living Wage Employees, including increased productivity (80%), staff retention and motivation (75%). These events, held to coincide with Living Wage Week, will provide an opportunity for the boroughs to celebrate the positive contributions of local businesses who have adopted accreditation as well as provide insight to those considering accreditation benefits to employers. WALTHAM FOREST – Thursday 8th November, The Real Ale Company & Trap Taproom, Unit 4 Ravenswood Industrial Estate, Shernhall Street, Walthamstow, E17 9HQ from 8.15am to 9:30am. To register your attendance for this event, please secure your ticket on Eventbrite. HACKNEY – Friday 9 November, 8:30am – 10am Hackney Town Hall, Mare Street, E8 1EA. To RSVP simply email and provide the name of your business and up to 3 attendees. Roman Road is a vibrant and diverse community that is in jeopardy. The area has the lowest home ownership rates in London, with 76% of accommodation provided by housing associations or private landlords. The private rental sector is expensive and short term. The housing provision is not meeting the long-term needs of residents who are finding themselves in compromised and unstable housing. This is coupled with a lack of affordable or social housing developments proposed in the area. However, they need more support locally from people who can help lead positive change in our community before it is too late. We are in a rare position with so few sites in London where it is possible for the community to even get a look in, we cannot let this one go. The landowner has recently informed them that they are considering alternative options, therefore we need the full support from the community before it’s too late. Individually, members contribute their local knowledge and expertise, together, we have influence and weight to attract funding and the affordable housing we all want to see. 27th November 19:00, 1 Gladstone Place, Roman Road Bow, London. E3 5ES. Book your place here.